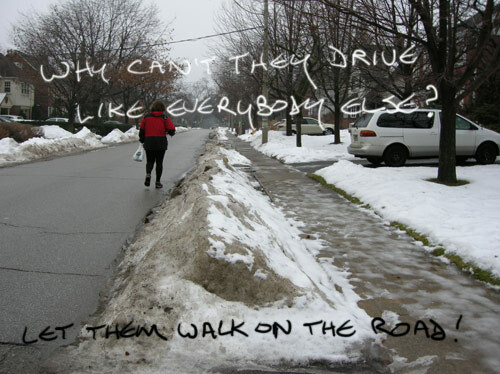 Let them walk on the road in 2011! 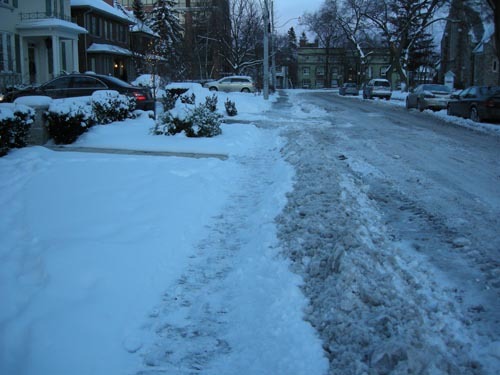 Whose Responsibility Is it To Keep Our Sidewalks Clear? Well my first thought was: what a gorgeous neighbourhood and I wonder if I could afford to buy one of those properties (but if not, I can always consider Detroit). The sidewalks. 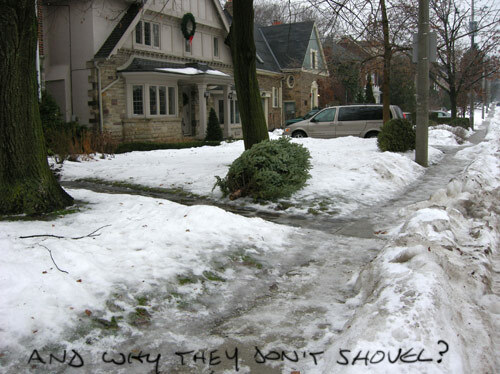 My hunch is that indeed the cost/benefit of shovelling doesn’t seem worth it to the Owners Who Don’t Shovel. They are insufficiently aware of the Walks In Their World. ps – sometimes my mom and I don’t shovel up here in Yellowknife and it’s truly because my mom is literally too old and sometimes when I come home I’m just too tired. Hmmm…I’m just imagining a greener city council for Toronto, where the council has mini ploughs that shovel the footpaths, but the roadway outside each home is the owner’s responsibility! Now that would shake everyone up a bit! Why don’t you suggest it? Another great photo essay! 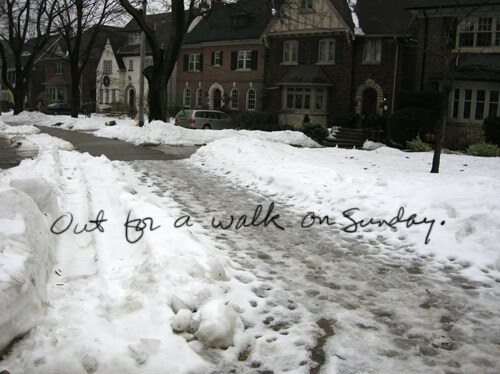 Your pictures reveal so much about neighbourhoods. 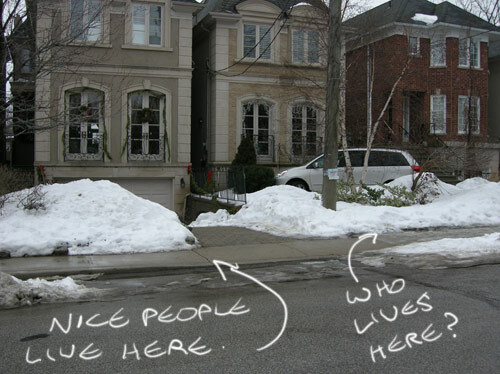 Whenever snow falls on our street all the neighbours come out to shovel and reconnect. 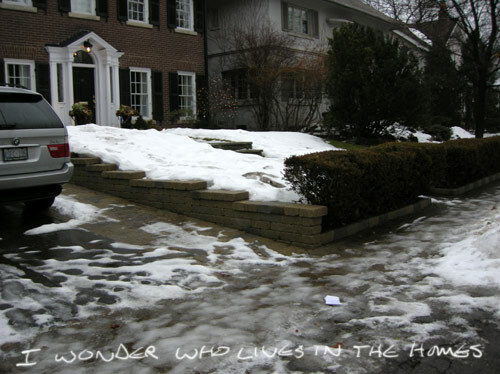 If someone is away we happily shovel their snow as well just as they would for us. 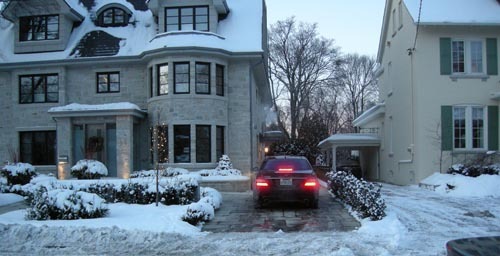 The houses are very beautiful but I wouldn’t want to share the sidewalks with those people. I also wonder how much any of them walk. 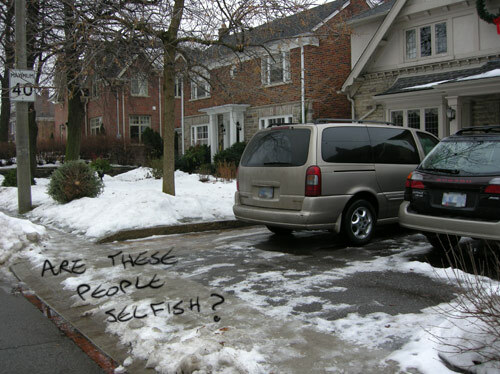 I’m sure they would be miffed if the streets for their precious cars weren’t plowed. This sounds cliche, but a man was hit and killed across the street from my home, walking in the street. You can bet after that everyone in the hood got religion and started clearing their sidewalks. (Yes, I had done mine that night, but he was on the other side of the street.) In my city (Quincy, MA) it is the homeowners responsibility to shovel, and the law that you must, and I think that is a reasonable burden, and avoids a needless way to spend my tax dollars. Also, those sidewalk machines can really do a number on any cobblestone similar curbing you may have installed. BUT, it is not enforced, so people are at risk. 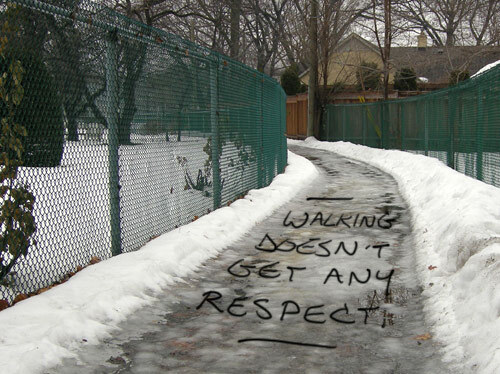 It must be enforced, with fines to those who don’t clear the walks within 24 hours, and the city coming in to do it after 24 hours. Could be a great revenue source. One way or another, it should not be allowed to force pp onto the street. My two cents. Thanks for keeping treehugging alive and well! Thnx Christine for your comment. Pedestrian safety is a big concern. When I first posted about this topic in 2008, there were a record number of pedestrian fatalities in Toronto. I’m with Daharja on changing the “responsibility” for shoveling. Of course, I live in a place where we rarely get snow (South Carolina, USA), plus my rural area has no sidewalks at all. I think the saddest thing to me about this is that my location is not at all walk-friendly. The few sidewalks in town are in horrible disrepair. How can I, as a citizen, improve my town and neighborhood’s “walkability”? 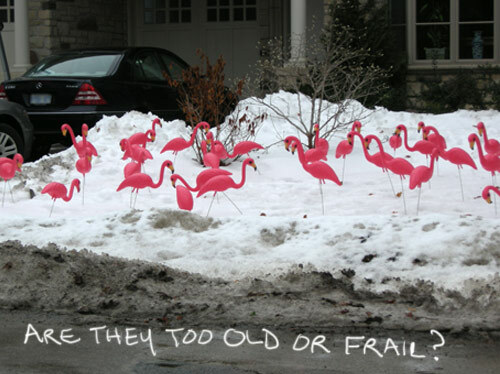 Love your thought as always, my Applied Creative Enviro sister up North. Oh yes. 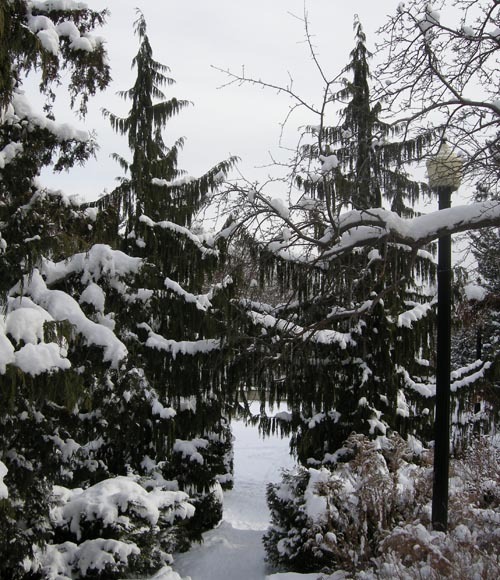 Unshoveled walks make me cranky, muttering to myself… BUT when a homeowner is outside shoveling their walk — THEN I praise them lavishly. Just yesterday I said enthusiastic thank you’s twice… of course they had no idea about this post, and what the backstory is. Thanks for your “slice’em, dice’em” late-night TV comment too. 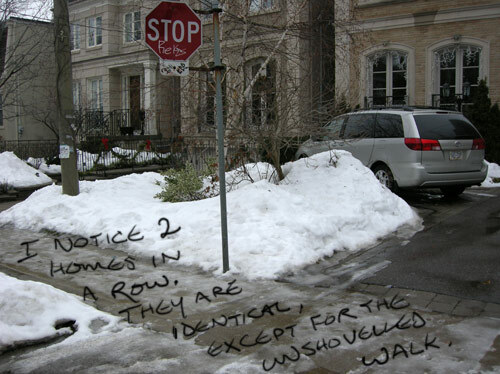 Every single house on that road that failed or fails to remove the snow from the sidewalks should be slapped with a hefty fine — repeatedly if necessary, to drive the point home. 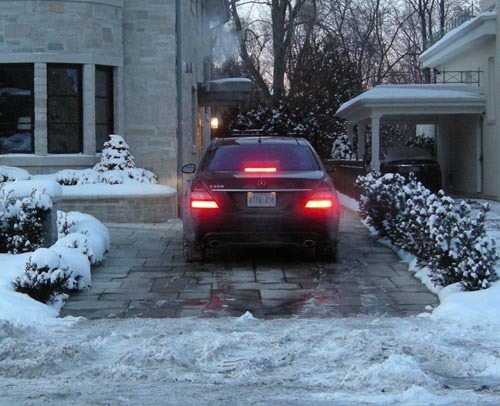 Judging from the luxuriousness of the properties which look like somewhere in the million-dollar range, they can MORE than afford to hire someone to shovel the sidewalks if they can’t do it themselves. 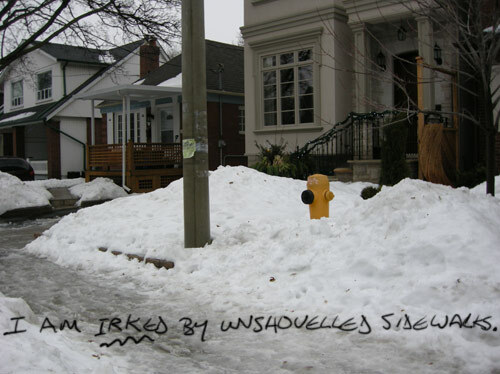 I live in Edmonton, and in the past, I’ve been ticketed and fined for accumulated snow. Once was all it took for me to get the message. Since breaking my leg last year snowblowing my driveway, I’ve contracted the removal to a company here in town. I’m pretty sure I’m not nearly as rich or monied as these residents so if I can afford it, so can they.